The original idea for Trash Talk! was sketched out on a napkin over dinner, obviously in the days before Zero Waste. Beth Bugbee, President Emeritus, suggested a customizable newsletter for kids featuring “Indy” and “Ana.” At the time, we didn’t imagine that the newsletter might one day be used in classrooms from coast to coast. What we did imagine was a “Weekly Reader” of sorts for recycling. (Do you remember the “Weekly Reader”? I still have fond memories.) We loved the idea, but no one was specifically requesting it. So, we continued designing brochures, writing how-to manuals, administering grants, and completing various other consulting projects. That germ of an idea became a seed at an Indiana Solid Waste Management Districts’ Education Roundtable meeting a year later. The District Educators knew that color printing was more effective, but, at the time, it was very expensive and their districts couldn’t afford it. Jim Britt, who had a small graphic design company and a relationship with a newspaper printer, suggested that newsprint might be a way to offer color printing at a lower price. The catch was that only the black ink could change. We now had a way to offer customized articles with color art at a reasonable price. We spent months on a mock-up and then started meeting with districts. Seven of them took a chance on the newsletter, a group we called “The Magnificent Seven.” In the fall of 1993, the press rolled on the first edition. 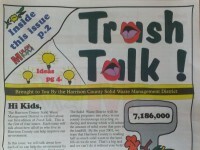 That school year, about 25,000 Hoosier elementary students received Trash Talk! The following school year, the inside pages became more activity-focused, serving teachers’ curriculum needs better and making the newsletter more fun for kids. The year after, we added the Teacher Guide. Thanks to state grant funding for youth education, Trash Talk! grew rapidly. Eventually, 35 communities in 12 states and the District of Columbia used Trash Talk! to educate upper elementary students about reducing, reusing, and recycling. Today, approximately 35,000 students in several states read Trash Talk!, which is now offered in both print and electronic versions.